LONG BEACH — The Southern California Yachting Association’s E.E. Manning Regatta for little boats was founded in 1935 to boost youth sailing, which it has done — but it’s also shown that you’re never too old for the sport. 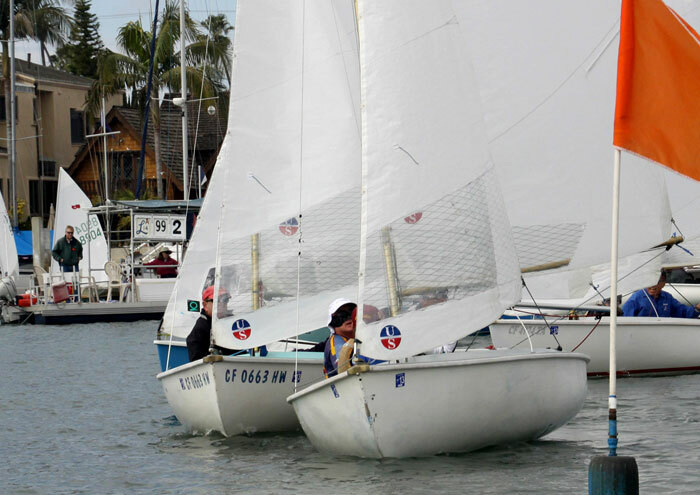 Two of the class winners at Alamitos Bay Yacht Club March 2-3 are AARP-eligible. Bruce Golison, 56, of Long Beach won the Lido 14 class on the inside bay; while outside in Long Beach Harbor, Peter Drasnin, 54, of California YC in Marina del Rey was winning the Laser Full competition. They are old enough to be fathers of Christopher Weis, 17, of Del Rey YC and his crew Dot Obei, 14, who subdued the 50-boat CFJ fleet and with it wrapped up the 2012-13 Shadden Series of four monthly CFJ regattas. There were 112 boats in six classes that found a range of conditions from a warm, light-wind Saturday to a cool double-digit southwest breeze Sunday reaching 13 knots, with gusts to 17. The Lidos were a battle all the way between Golison and crew Dina Corsi and the class’s most determined veteran competitor, Stu Robertson, with young Sammy Elshaharwy as crew. Golison won by three points, but only after a hard-driving start in the first of four Sunday races, when both boats were over the start line well before the horn. Both were unsure if their sail numbers had been called by the race committee, so they continued to sail upwind for about 50 yards until Golison finally turned back. Robertson kept going but dropped out much later and took a 10th. Golison had time to recover and finish fourth in the 10-boat fleet, but it wasn’t over yet. He still had to outscore Robertson in the last three races, 4-1-3 to 6-4-1, to secure the three-point win. The Lido actually is a training vehicle for Golison’s Etchells class campaign over the next two years — the North Americans, which he won in 2010, at Newport, R.I., and the Worlds in 2014. The strongest Etchells competition is on the East Coast. Drasnin’s strongest competition came from Dave Leuck from San Diego’s Mission Bay YC, three points back, and Brian Cotrell of Redondo Beach’s King Harbor YC, with whom he shared the first day’s lead. But after Drasnin won the first two of the last three races Sunday, he was able to skip the last race as his throwout. He is also a past Manning Regatta winner — in the 1970s. Weis, who won nine of the 23 Shadden Series races, was pushed Sunday by Del Rey YC teammate Roberto Stevens, who with crew Annika Garrett were within three points going into the last race, when they finished seventh and 14th. The series is named for Long Beach’s 1988 Olympic silver medalist, John Shadden. Competition in the Manning, founded in 1935, is limited to one- and two-person dinghies — no keelboats allowed. The Manning is raced annually at Alamitos Bay YC. It was first contested in 1935 to honor E.E. Manning, a member of the Los Angeles YC who during his lifetime was an active sponsor and promoter of dinghy racing.